Product information "Alanine Transaminase Colorimetric Activity Assay Kit"
Alanine Transaminase (ALT), also known as alanine aminotransferase (ALAT) or serum glutamic pyruvic transaminase (sGPT), is a homodimeric cytoplasmic pyridoxal phosphate-dependent enzyme involved in cellular nitrogen metabolism, amino acid metabolism, and liver gluconeogenesis. ALT mediates conversion of major intermediate metabolites, catalyzing reversible transamination between alanine and alpha-ketoglutarate to form pyruvate and glutamate. ALT is widely distributed in many tissues but is found in greatest abundance in the liver, and to a much lesser extent in the kidneys, heart, and brain. The major role of ALT in the liver is the conversion of alanine to glucose which is then exported to the body to be utilized in a multitude of processes. ALT has also been found to play an important role in neuronal function by supplying an important source of neuronal glutamate through the analine-aminotransferase reaction. Serum ALT levels are generally low, but may spike during disease states or in the event of tissue injury. As such, ALT levels are routinely used as indicators of medical issues, particularly liver diseases. Increased levels can be seen in patients with diabetes, cirrhosis, fatty liver disease, and hepatitis. Beyond liver disease, increased ALT levels have been noted in cases of carcinoma, mononucleosis, muscular dystrophy, and cardiovascular disease. Cayman's Alanine Transaminase Colorimetric Assay Kit provides a convenient method of detecting ALT activity in serum, plasma, tissue samples, and cell lysates. Measurement of the ALT activity is carried out by monitoring the rate of NADH oxidation in a coupled reaction system employing lactate dehydrogenase (LDH). 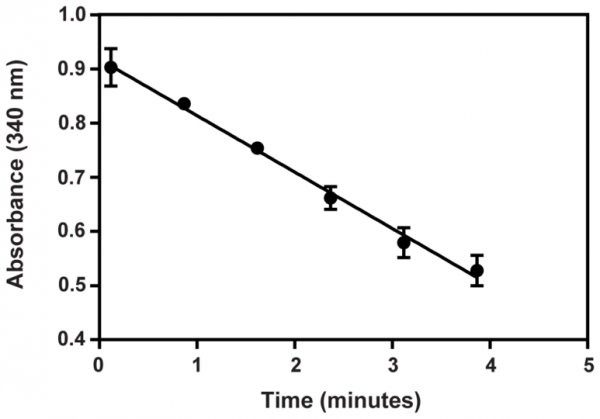 The oxidation of NADH to NAD+ is accompanied by a decrease in absorbance at 340 nm. Under circumstances in which the ALT activity is rate limiting, the rate decrease is directly proportional to the ALT activity in the sample. Customer review for "Alanine Transaminase Colorimetric Activity Assay Kit"